*The sinus infection is gone. That was my first one, and it was horrible. *My school received a glowing report on their SACS evaluation. *Lydia Grace's birthday and birthday party went well...I'm working on those blog posts. *We found new childcare for L. G. She is being watched by a very nice Christian lady. She is the only child in her care, so she is getting loads of attention. *I didn't win the LBB/Dharma Challenge with my baby outfits. There were over 150 fantastic entries submitted. I did have fun participating though. It was a great challenge to myself to try some new sewing techniques. I also ended up with some cute outfits for Lydia Grace. *I'm ready to start blogging again. I've missed it... I'm not one of those amazing blogging moms out there who has thousands of followers. I'm just a mom with a few close followers...blogging about her life and her family if for no other reason than the fact that I enjoy it. I hope those of you who do read it enjoy it too. 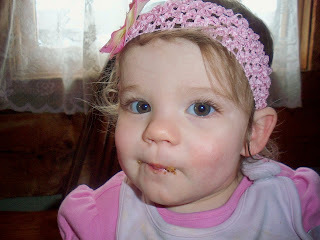 That is yummy food from the Apple Cake Tea Room on her face.